I have known Larry D. Kump for close to 30 years and have never known him to be anything but upright, honest, full of integrity, loyal, moral, and compassionate. Even in times of trial on a personal front, Larry never complained or felt sorry for himself. Instead, he went out of his way to make sure the needs and feelings of others were taken care of. Spend an hour with him and you will walk away feeling like you have known him your entire life. His dedication to his profession, his fellow co-workers and friends is just the qualities I look for in a leader. He will not bow down to outside pressure when he believes in something. He will fight to the finish to ensure fairness and equity for everyone is accomplished. Footnote: Campaign contributions to "Friends of Larry D. Kump" (P.O. Box 1131, Falling Waters, WV 25419) will be put to prudent use in support of good governance. Not long ago, I couldn't get enough of politics. I loved the idea of our system of government. I tried to get people engaged in the issues. I was so proud of the idea that in this country, everyone had the right to be involved with the election of our local, as well as our national, leadership. I hate to admit it, but for a while, I all but checked-out. The idea that someone like Barack Obama with a world view so much different than what I thought was most Americans, and a campaign promise to "fundamentally change" our country to reflect that view, that he could be elected to the highest office in land not only once, but twice, was beyond comprehension to me. After he was elected to a second term, I truly felt there was little hope for this nation going forward. Not because of him, but because the people of this nation would elect him. But there is hope, one hope. But only if we replace career politicians that have a record of pandering to special interests. Those who pick out certain groups and say anything that will get them excited enough to win their vote. Those that would censor (or try to) any opposing, or objective views of their record or their true character. Those who disregard our Constitution as if they have a better idea. Those who are so politically motivated that votes are more important than the general health of our country. We need to know who these politicians are. We need to know their record, who their friends are and where there heart is. 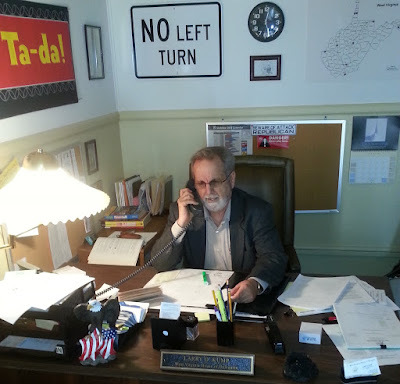 I've known Delegate Larry Kump for close to 20 years and I can attest that this is a man with absolute integrity. An independent thinker. A man who loves people, the Lord, this state and this country. He is a man of action, who has the courage to stand on his convictions and a record to back it up. Someone once said "all politics is local." If that's the case, then I hope we will start cleaning up the mess we have by recognizing local leaders like Delegate Larry Kump for the honorable service he's given the 59th District and the State of West Virginia. With people like Larry Kump representing West Virginians, we can rest assured we have someone fighting for our Constitutional rights. With primary elections coming up this coming May, It's so important for thinking people to stand behind elected leaders with a proven record of personal and constitutional integrity. When you know someone you can count on to do the right thing, you stand behind them. The people of the 59th district need to re-elect Delegate Larry Kump, a man with a record of fighting for the rights of all West Virginians. It is unusual for me to be a proponent of additional government involvement in our lives. Far too often, otherwise well meaning elected officials end up restricting our God given rights and also impede our paths to prosperity. However, this is a proposal that our West Virginia State Legislature and school boards would do well to adopt. 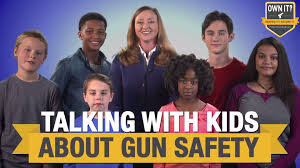 A generation or so ago, many West Virginia school students were given firearms safety training as part of their education. It is my understanding that this training was conducted by the West Virginia Division of Natural Resources Police. Postscriptum: Please share this message with others, and also visit www.facebook.com/LarryDKump for more about this and other issues!